Today’s hearing took place before a joint meeting of the House and Senate Committees on Ways and Means. The Secretary of Administration and Finance also participates in the hearing, the purpose of which is for State budget writers to reach a bipartisan consensus of the Commonwealth’s current economic standing, as well as the fiscal outlook for the coming 18 to 24 months. Kicking off each year’s hearing are officials from the Department of Revenue, followed by the State Treasurer and officials from key state departments whose policies or programs have a direct and major impact on the Commonwealth’s finances. For instance, seated beside State Treasurer Deb Goldberg at today’s hearing was the Commonwealth’s Chief Actuary James Lamenzo of the Public Employee Retirement Administration Commission (PERAC) and the Lottery’s Executive Director Michael Sweeney. Lamenzo’s work is essential to all public retirees, as he is responsible for financial oversight of pension funding for the State, Teachers and all 102 local retirement systems. Following Treasurer Goldberg was the chief economist for the Federal Reserve Boston, along with a host of private sector economists and fiscal watchdogs. FY18, which ended June 30th, posted year-over-year growth of 8.5% resulting in a $1 billion surplus. It was just the 3rdtime in the past 30 years where such robust economic growth was recorded in Massachusetts. So far FY19 appears to also be exceeding expectations, with year-to-date revenues posting a surplus of some $425 million. As a result, the Commonwealth’s so-called “Rainy Day” Fund now exceeds $2 billion for the first time since 2008’s Great Recession. Building up the Rainy Day Fund is widely seen as a positive step, which has a direct impact on the state’s bond rating and its borrowing power. Both DOR Commissioner Christopher Hardingand Treasurer Goldberg also cited the success of the Commonwealth’s Pension Reserves Investment Trust (PRIT) Fund as being a majority contributor toward the state’s financial stability. PRIT now holds more than $74 billion in public retiree / employee pension assets. The system returned 17.86% in 2017, placing it amongst the best performing pension funds in the country. Both the State and Teacher’s Retirement Systems are on target to be fully funded by 2036 – now less than twenty years away. In her testimony, Goldberg cited PRIT’s focus on “return, risk and cost” as metrics driving the success of the pension system. She also pointedly noted that returns cannot come at the sacrifice of the system’s members. “We will not turn our backs on retirees in order to get financial returns,” commented Goldberg during the question and answer portion of her testimony before the Joint Committee. Goldberg has long been a staunch advocate for public retirees, fighting for increased COLAs. As for the FY20 budget, Governor Baker is scheduled to file his budget proposal late next month. The House will then take up its version in April, with the Senate acting on its version in late May. 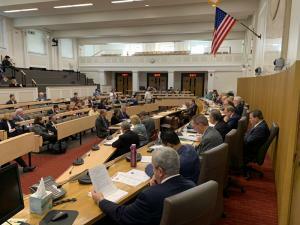 The FY20 budget is scheduled to take effect on July 1, which traditionally begins the fiscal year in Massachusetts.